Despite being one of the poorest countries in the world, in recent years Burkina Faso has made great strides toward meeting its development goals. The government of Burkina Faso has dedicated a significant portion of the nation's GDP to spending on health projects and the Ministry of Health has implemented a working contraceptive security strategy. The MoH's reproductive health commodity security initiative, supported by the USAID DELIVER PROJECT, has been a notable success thanks, in large part, to innovative financing. 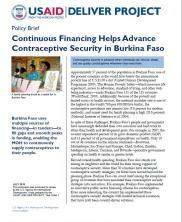 Learn about how continuous funding helped Burkina Faso build a reliable supply chain of reproductive health commodities in this USAID DELIVER PROJECT Policy Brief.